The completion of the Silver Lane's first stretch of track has been pushed back another four weeks, officials announced Wednesday -- which means that the start of passenger service could now be delayed into late winter. More tests are needed before a new firm completion date can be determined, said Dulles Transit Partners, the contractor building the Metrorail expansion in Northern Virginia. The construction of Phase 1 -- a stretch of new track from Falls Church to Reston -- was originally expected to be completed Sept. 9. After that, the line would be turned over to the Washington Metropolitan Area Transit Authority (WMATA) for 90 days of testing and training. But last month, planners announced that WMATA would not have access to the new line until October. Metro ran test routes on the Silver Line in Virginia Friday. Railcars zipped back and forth on the tracks. The Silver Line will help commuters who live in northern Virginia and give folks a Metrorail route to Dulles International Airport. Its first phase is scheduled to open in December. Wednesday's announcement adds four more weeks to that timetable, bringing the total delay to about eight weeks, Marcia McAllister, communications manager for the Dulles Rail Project, told NBC Washington. McAllister said the delay is due to the need for testing and equipment checks, and could change again. "We've been building the project component by component, and we're getting to the point where you have to test the entire system -- and not just the system they built, but making sure it connects with the existing Metro system," she said. Phase 2 of the Dulles Rail Project given the green light to start construction from Reston into Loudoun County. News4 transportation reporter Adam Tuss has the story. 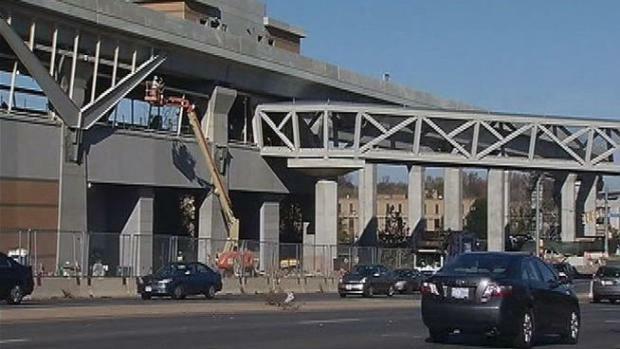 The Silver Line had been expected to begin carrying passengers in late December. A month ago, that timetable was amended to January. The additional time could push the start of passenger service into February, although McAllister said the ultimate launch date will be in Metro's hands. "Our main goal has always been safety and quality -- it supersedes all else," said Metropolitan Washington Airports Authority (MWAA) President and CEO Jack Potter in a release. "Any project this large and complex is inevitably going to encounter unexpected issues that require additional tests and adjustments. With Phase 1 of the Silver Line nearly complete, there isn’t sufficient time in the schedule to recover from recently identified matters within the original plan." Officials say early work has also already begun on the project's Phase 2, which will stretch from Wiehle Avenue in Reston to Dulles International Airport and into Loudoun County.